Major factors contributing to the failure of people to live their dreams and achieve their full potential are the lack of Accountability, Mentorship, Technical know-how and Productive Networks. It is on the back of these that the Torch Bearers’ Network (TBN) was formed by Ekow Mensah to empower and provide relevant resources to individuals who are passionate about igniting their dreams, impacting lives and restoring hope to many around the world with specific focus on Africa. 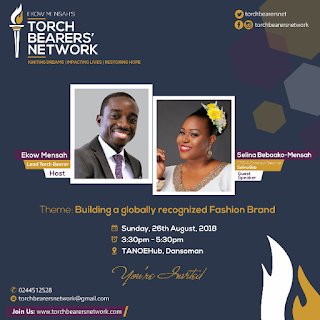 This August, as part of its 2nd bi-monthly meeting, TBN is hosting Selina Bebaako-Mensah; the founder, CEO and Creative Director of the award winning and globally acclaimed fashion brand; Selina Beb on Sunday the 26th of August, 2018 at TANOEhub, Dansoman in Accra, Ghana. Selina will be speaking on the topic ‘building a globally recognized fashion brand’. She will throw more light on the Selina Beb success story, its global reach, its challenges, its future and lessons learnt in her quest to build a globally competitive indigenous African fashion brand. Selina Bebaako-Mensah, a broadcast journalist turned celebrated iconic African fashion designer, is the founder of the famous award winning African fashion brand Selina Beb. Born in Accra and schooled on four continents (Ghana, England, Italy and China), she developed a curiosity for cultures which later channeled into her love for fashion. She has been globally recognized for the depths of her colorful creations and it’s the potency of these creations that has made her a force to reckon with in the African fashion industry. Since she launched Selina Beb in 2012, her list of awards are over flowing and keeps growing. Selina Beb designs have walked many catwalks from Ghana, London, Rome and beyond carrying with it the true Ghanaian vibrancy and flavor. Fast becoming the most empowering, inspiring and insightful platforms in Ghana for young passionate dreamers, the TBN Bi-Monthly Meetings, hosted by the impact-driven Ekow Mensah, is highly anticipated. Hosting powerful speakers such as Daniel Sarpong Jnr and now Selina Bebaako-Mensah, it is a meeting not to be missed. Coming off on the 2nd and 4th Sundays of every month, TBN Meeting is the place to be for anyone passionate about living their dreams, impacting lives and leaving a lasting legacy.